The front and back of the forty-first sketch in the collection. The collection consists of sketches and paintings created by John G. Keyser dated September 1862 to December 1863 and two sketchbooks, one dated November 1862 and the other from March 1863. Individual sketches comprise of fifty-seven physical pages of sketches, five physical pages of paintings. The physical collection is comprised of 6 boxes. Five of the six boxes contain Keyser’s sketches and original artwork. The sixth box contains miscellaneous documents that the society has accumulated over the years about Keyser and his sketches. The collection is both a physical and a digital collection. Digitized, the collection comprises of ninety-five digital files. There are sixty-three files of the individual sketches scanned. Because of the size of some of the sketches, they were scanned in pieces. Sketchpad 1 consists of 13 files and sketchpad two has nineteen files. The backs of the sketches were also scanned. The collection is available for research. Because of the fragility of the sketches the digital files have been printed. Either the digital collection or the copies can be viewed for research. Only under certain circumstances can the researcher have access to the original sketches. The sketches are also available for usage for institutions. Institutions must ask permission and give appropriate citation and credit to the Cumberland County Historical Society. On September 2nd, 1862 Keyser enrolled in the army, joining the Twenty-Fourth Regiment, New Jersey Volunteers Company H.
The sketches within this collection were created by John G. Keyser between September 1862 to July 1863, while he served as a private for the Twenty-Fourth Regiment, New Jersey Volunteers Company H during the Civil War. The New Jersey Twenty-Fourth Regiment served nine months. Keyser volunteered and served from September 2, 1862 – June 19, 1863. His company was involved in both the Battle of Fredericksburg in December 1862 and the Battle of Chancellorsville in May 1863. Company H travelled from New Jersey to Baltimore, Washington then to its final destination of Virginia, where they spent majority of their time. 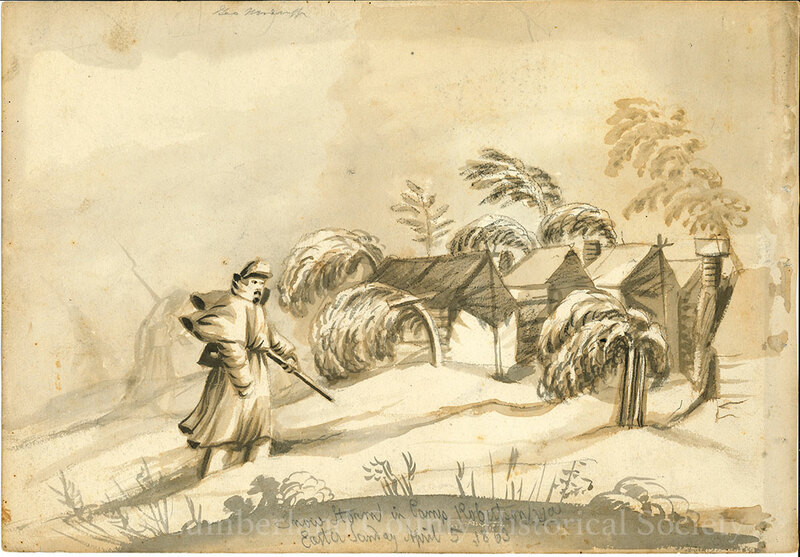 Keyser captured the travels, the camps, battles, and men, immortalizing them in his sketches. Once Keyser was out of the service, he returned to Bridgeton, New Jersey. He continued working as a painter. He sold sketches he had done while in Europe of battle scenes of Fredericksburg and Chancellorsville, along with sketches of the different camps of the 24th Regiment, New Jersey Volunteers Company H from Beverly, NJ to Virginia. In 1891 Keyser applied for his passport to return to Germany. Although he planned on staying only a year before returning to the United States, Keyser fell ill in Germany and died there on February 11, 1902. His death was announced in the Bridgeton Evening News on March 5, 1902. 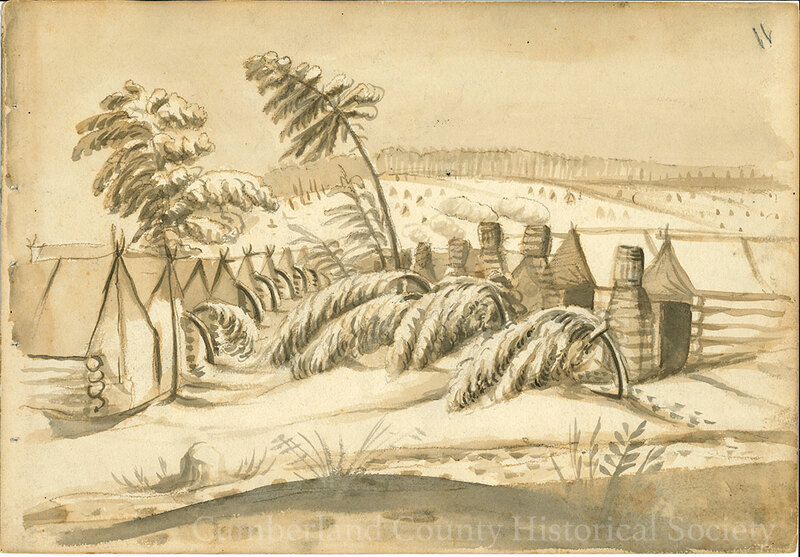 The overall collection consists of sketches, and paintings of battle scenes, encampments, prisons, and soldiers that John G. Keyser saw and experienced during his service in the Civil War. The exact date of the acquisition of the collection is unknown, but is believed to have been in the Society’s possession for almost as long as the Society’s existence. The original order of the collection was altered, the individual sketches have been arranged to fit the historical timeline of the travels, camps, and battles of the Twenty-Fourth Regiment, New Jersey Volunteers Company H. The sketchbooks are still in the original order have not been altered. There were some discrepancies of the dates that were marked on the sketch with the image. 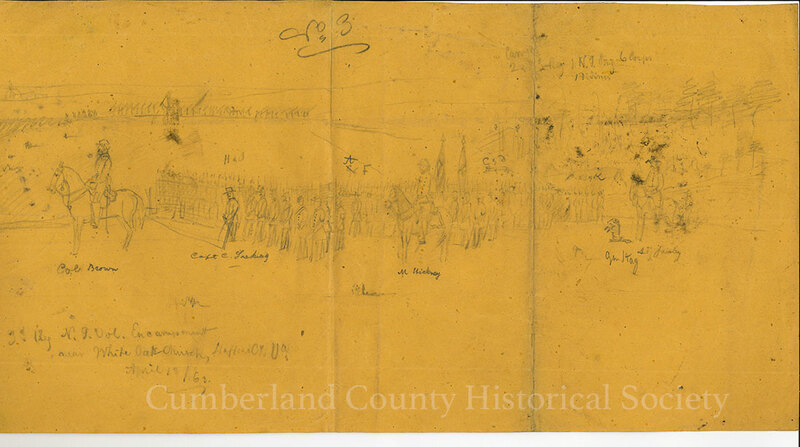 For example, sketch #4 is a scene of Baltimore and is dated for December 3, 1862, Keyser and the regiment had left Maryland and were already in Virginia by December 3, 1862. Instead of following the date, the sketch is in the order of the image. Drawings and paintings whose dates remain unknown have been placed at the end of the collection or with similar sketches as appropriate. 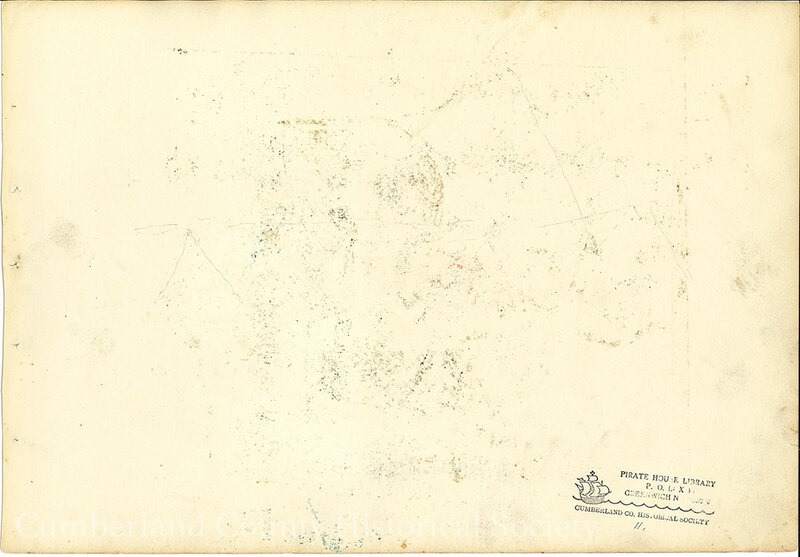 For example, sketch #18 is of Fredericksburg with no date and was put in the order with the battle of Fredericksburg sketches. Another example is painting #10 that has no date, but because there are only three paintings, it was placed in the order with the other paintings. W. Andrew Boyd, Boyd’s Cumberland County Directory, For 1879-1880 a Complete Directory of the Cities of Bridgeton, Millville & Vineland, Together with a Complete Business Directory of the Whole County, Giving the Names of all Professions, Trades and Occupations, and a Very Large List of Farmers and Fruit Growers, With an Appendix of The Cities, (Wilmington: James & Webb, 1879), p. 64. Record of Officers and Men of New Jersey in the Civil War 1861-1865 Vol. I, (Trenton: John L. Murphy, Steam Book and Job Printer, 1876), p. 799, 812-814; New Jersey Census Record 1860; John G. Keyser, “Form for Naturalized Citizen,” (October 9, 1891), Passport Application, Received from the National Archives and Records Administration. W. Andrew Boyd, Boyd’s Cumberland County Directory, For 1881-1882 a Complete Directory of the Cities of Bridgeton, Millville & Vineland, Together with a Complete Business Directory of the Whole County, Giving the Names of all Professions, Trades and Occupations, and a Very Large List of Farmers and Fruit Growers, With an Appendix of The Cities, (Boyd Bros., 1881), p. 53; Record of Officers and Men of New Jersey in the Civil War 1861-1865 Vol. I, (Trenton: John L. Murphy, Steam Book and Job Printer, 1876), p. 799, 812-814; “He Loved His Adopted Country, Reminiscences of John G. Keyser, Our Former Citizen. Artist, Soldier and Patriot.”, Bridgeton Evening News, March 5 ,1902 (Bridgeton, 1902). ; George Nixon ed., “Keyser’s Campaign Sketches of the 24th Regiment N.J. Volunteers” in The Bridgeton Chronicle, (Bridgeton: March 28, 1868). James J. Reeves, History of the Twenty-Fourth Regiment, New Jersey Volunteer, (Camden: S. Chew, Printer, Front and Market Streets, 1889). Record of Officers and Men of New Jersey in the Civil War 1861-1865 Vol. & Vol. II, (Trenton: John L. Murphy, Steam Book and Job Printer, 1876).